1) I drank LOTS of water. I always had a jug of water near me so that it was easily accessible. Your skin needs a lot of water, especially as it is stretching so much, so I made sure to drink a lot. 2) I ate lots of good fats from foods like avocado and almonds. I tried to incorporate them into my meals and snacks each day, and have them easily on hand so that I grabbed those things instead of the junk food that I often wanted instead 🙂 Much of taking care of your skin and body is from the inside out, so eating lots of healthy food is important. Don’t worry, though, you better believe I indulged in a donut or pizza more often than I should have as well! 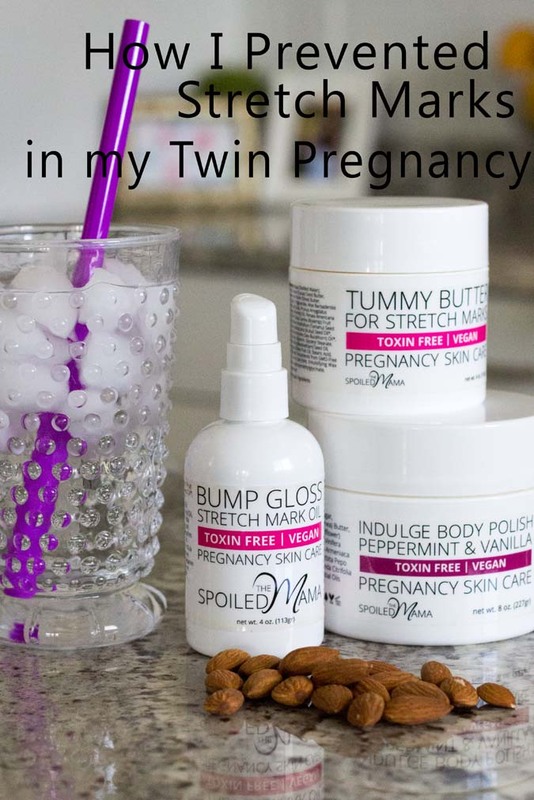 3) I used the Spoiled Mama Stretch Mark Prevention Kit every single day without fail, at least once, but most of time in the morning and at night. I would use the Peppermint and Vanilla Body Polish on my tummy, bum and thighs in the shower. It buffed away the dead skin and really hydrated my skin. After I dried off, I would rub on the Bump Gloss Stretch Mark Oil, then top it off with the Tummy Butter. I always made sure to get my thighs and bum really well too. That’s it! My belly grew REALLY fast in the last couple months and I thought that I would definitely get stretch marks so I was preparing myself to accept it, which would have been fine. Our bodies make beautiful humans so if stretch marks are a side effect of that, I think it’s worth it. As my body started to shrink back after pregnancy and lose the 50 pounds of water weight (hello, preeclampsia!! ), a few stretch marks showed up on my bum, but my thighs and tummy don’t have any stretch marks at all. I think a lot of that has to do with what I drank and ate, and using the Spoiled Mama products religiously. You can get 10% off at The Spoiled Mama using THIS LINK and by using code sliceofstyle10 at checkout through 10/21! Free shipping if you spend $50. PS: Loving this tips on how to prevent stretch marks? Click here now for more twin pregnancy essentials! !